Monday, 3am.Gabriel Lee Harker had been locked away in his personal observatory for just over six hours, gazing at galaxies and scanning for spacecraft - his body fulled by high-sugar candy and espresso coffees. 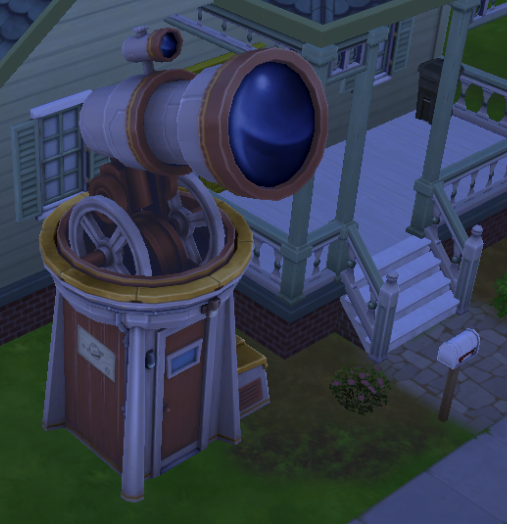 As the town's foremost "UFOlogist", it was his duty to ensure any alien activity occurring above or within Willow Creek was accurately recorded and documented, True, he'd had the job for two years, and had yet to see anything out of the ordinary, but he wasn't going to let a little thing like that cause him to leave his post.By the time 5am rolled around, every star was still exactly where it should be, and he hadn't seen any flying saucers, cups, or dishware of any kind. Realising that he had to get ready for work by 9, and with his coffee pot drained to the dregs, he reluctantly decided to go and get some sleep.It had been another disappointing, alien-free night.Still - he lived in hope. Exhausted from his long night of alien-spotting, Gabriel decided to ignore the sharp ring of his 8.30 alarm. By the time he work up again, it was nearing 10am. Panic-stricken, Gabriel leapt out of bed, hastily put on some clothes, popped a breakfast pastry in the microwave, and wolfed it down while sprinting for the bus to work. If "Combined Eating and Running" ever became an official sport, Gabriel would undoubtedly be a gold medal Olympian. 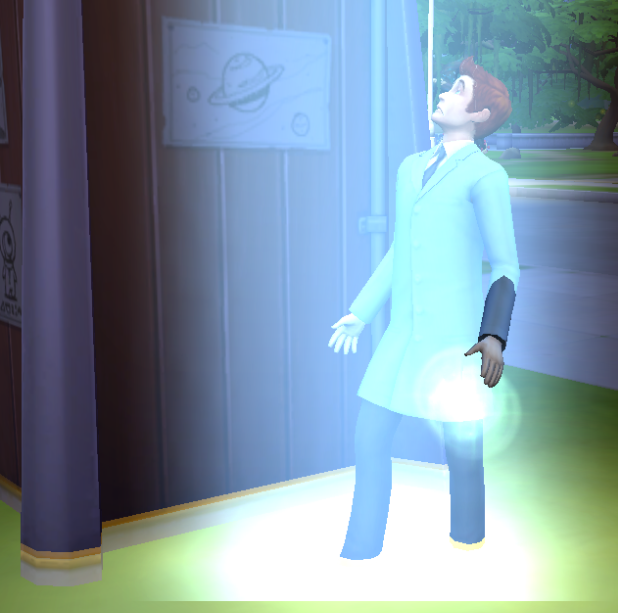 Upon reaching the automatic glass doors of the local laboratory, Gabriel quickly dashed inside and headed straight to the staff locker room, praying to high Plumbob that his boss hadn't seen him come in. By the time he had decontaminated himself and changed into his lab attire, he was fairly certain he was in the clear. He opened the locker room door with a certain cool confidence... only to see his manager stood right in front of him. "Sorry, sir... I was up late doing some... personal research." 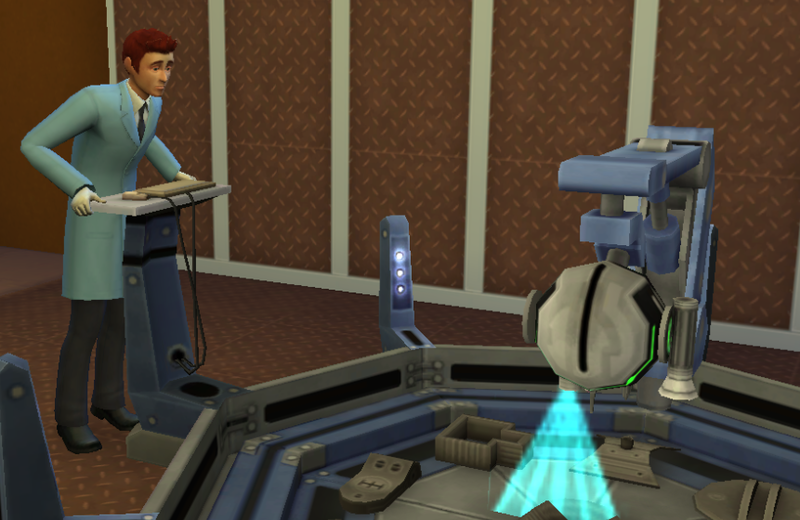 "Ah, yes... your colleagues in the Inventing Room have told me all about your 'extra-terrestrial activities'. You need to get yourself back to Earth, my boy! Now get to your post, and don't let me catch you running in at this ridiculous time again!" Gabriel didn't need to be told twice. He scurried hurriedly towards the Inventing Room. "Yes, sir! Sorry, sir! Won't happen again!" By the time noon rolled around, Gabriel was hard at work on his latest invention: a caffeine-powered car engine. As he coded the measurements and design blueprints into the crafting robot, he hoped that no-one had broken into the soda stash he'd been building up in the staff kitchen for six months. Suddenly, he was distracted by the sound of a loud bang, and a voice he didn't recognize - a sweet, melodic voice - shouting something in a language he didn't understand. He glanced over in the direction where the noise had come from... and saw her. Her long blonde hair, tied back in a high ponytail, shone like the golden sun. Her eyes sparkled even when they were intensely focused on her work. Her hands were slim within her safety gloves. As Gabriel watched her, his felt his heart beat faster. After a quick look-around for the manager - who thankfully was on his coffee break - Gabriel loudly hissed to his workmate, Julian, desperate to catch his attention. Julian turned around to see Gabriel madly gesturing for him to approach. Sighing, he walked over. "That woman - the blonde one, using the chemistry set. I've never seen her before. Who is she?" "Oh - she's new here. Just started today. Russian lady, doing a PhD up at the university. Her name is Katerina Malykhina." Gabriel spoke her name as if she was a goddess. Swallowing nervously, Gabriel slowly walked toward her - moving slowly, as if going to his own funeral. If he didn't make a good first impression, he thought, he might as well be - his colleagues would never let him live it down. 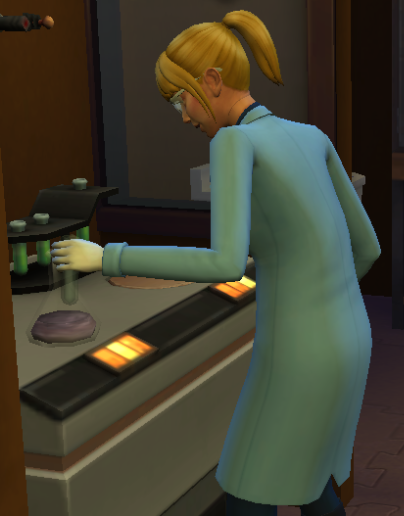 Upon reaching the chemistry workbench, he reached out and tapped Katerina on the shoulder - which startled her so much, she jumped up and dropped the vial she was holding onto the floor. "Oh my Plumbob - I'm so sorry!" "Here, let me clean it up..."
"No, really, there's no harm done..."
"No, no, please... oh Plumbob, I'm such an idiot!" Once Gabriel had mopped up all the split liquid and disposed of the glass shards, Katerina walked up to him. Being careful to avoid another incident, she got his attention by clearing her throat. "Thank you... for your help. You really didn't have to do that." "Yes, I did. It's my fault the vial got broken. All I wanted to do was say hello, and I went and made a mess of it, just like I do everything else..."
"There, there, now. Your intentions were good. You just chose a bad time, that's all." "Listen... how about you and I go for a coffee together? We could have a chat, introduce each other. I'm new around here - it would be nice to get to know people." Gabriel was stunned. He'd expected a slap in the face for what he'd just done - not the offer of coffee and a chat. "I... I'd be delighted to." "Good. Meet me in half an hour." True to her word, Katerina was sat waiting for Gabriel in the canteen exactly thirty minutes later. Although his new acquaintance seemed kind, he had feared some kind of revenge set-up. 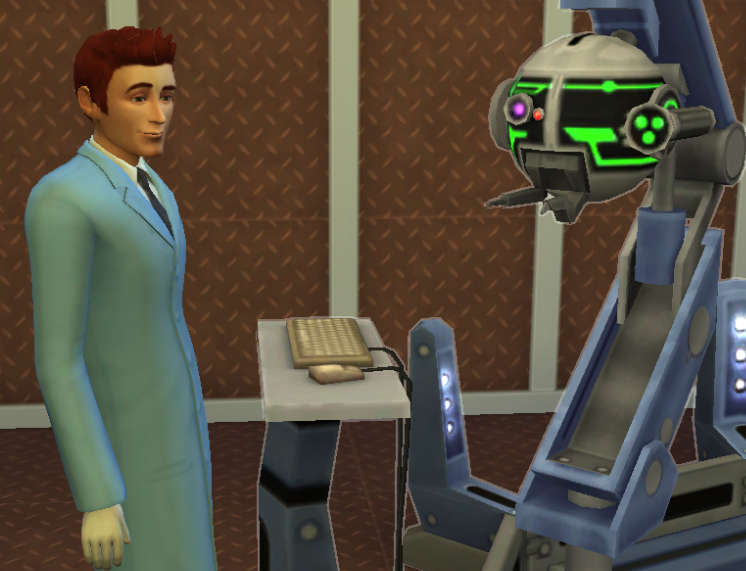 As they chatted, it became clear to both of the scientists that they had quite a lot in common. They had similar tastes in books and music, and, much to Gabriel's delight, Katerina was even quite open to the idea of aliens. "I'm not saying they exist," she explained, "but I think it is plausible that they might." Over the next few weeks, the two met for coffee and a chat almost every lunchtime. About two months after their first meeting, Gabriel gathered up all of his courage and asked Katerina if she cared to come his house for dinner - "just as friends, of course". She accepted the offer, smiling. After enjoying a takeaway pizza and some mint choc chip ice cream - "I never said I was a good cook!" 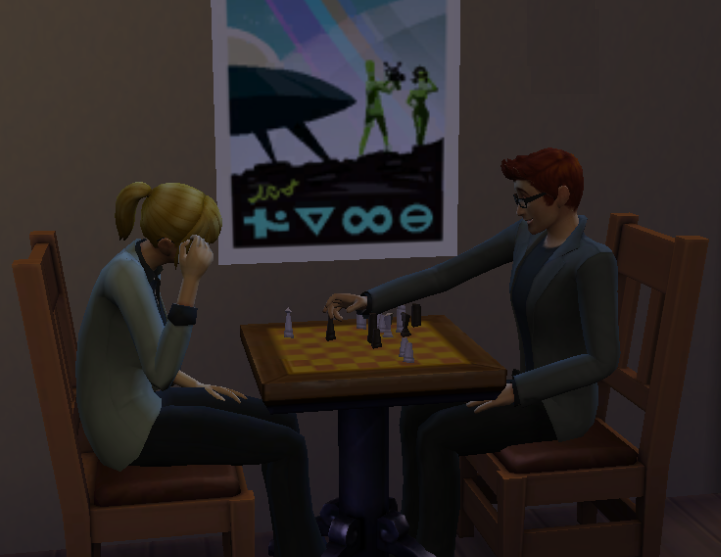 - the pair decided to play a game of chess. Gabriel, who had been captain of the chess team in school, found his new friend to be a worthy and talented opponent. 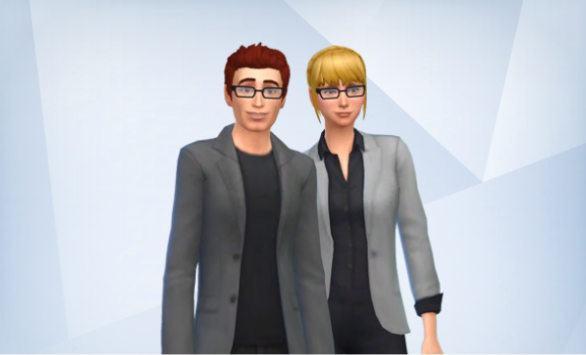 Three months after they'd met, Katerina and Gabriel became roommates. Five months after they'd met... "The Incident" happened. I like your story so far! 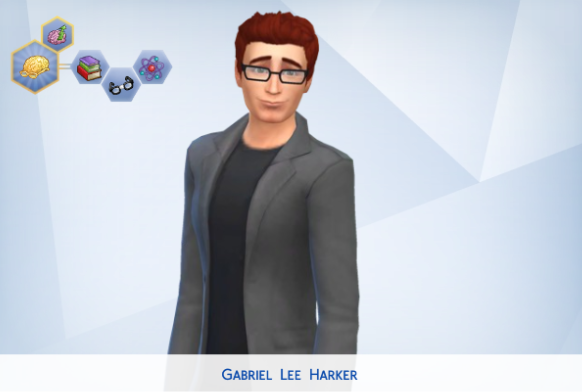 Gabriel is a cutie and a real sweetheart, hopefully he can impress Katerina so they become a bit more than roommates ^.- I've not played too much of Get to Work but the 'incident' looks exciting... I'm waiting to find out what happens next!! And welcome to the community!! Sharing stories is loads of fun and having your own style makes your work even better. Thank you very much! I'll be sure to check out some of your legacies, too!